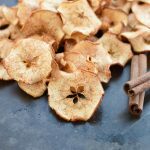 Crunchy Chewy Apple Chips sprinkled with cinnamon and sugar and baked in your oven. Preheat oven to the low temp of 200 F.
Wash and dry all the apples. Thinly slice the apples with a ceramic mandolin. Place all the apple slices on the covered baking sheet. Sprinkle with a mixture of sugar and cinnamon. Bake for 1 hour. Flip the apples over and bake for another 1-1.5 hours. Turn the oven off and keep the apples inside as the oven cools down for another 1 hour. This long bake time will help the apples get crunchy. Some apples might be chewy and only slightly crunchy after 3 hours in the oven. Store apple chips at room temp in an air tight container up to one week.